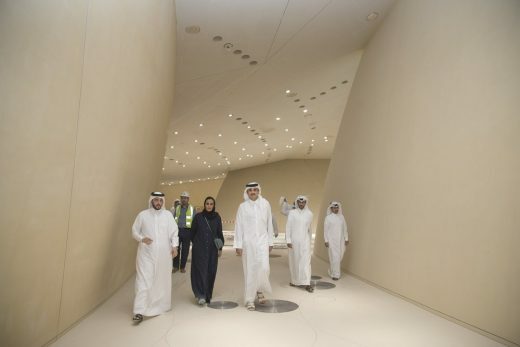 HH the Emir Sheikh Tamim Bin Hamad Al Thani yesterday visited the site of the upcoming National Museum of Qatar. During his visit, HH the Emir was taken on a tour of the site by H.E. Sheikha Al Mayassa bint Hamad bin Khalifa Al Thani, Chairperson of Qatar Museums and Mansoor bin Ebrahim Al Mahmoud, Chief Executive Officer and Special Advisor to H.E. The Chairperson. During the visit, H.E. Sheikha Al Mayassa, Chairperson of Qatar Museums, announced that the official opening date of the National Museum will be in December 2018. The National Museum of Qatar is built around Sheikh Abdullah bin Jassim Al Thani’s original palace, one of Qatar’s most recognizable landmarks and a building that served as a monument to a historic way of life in Qatar. This palace has a unique historical significance for the State of Qatar and has been recently fully restored. The palace will be a fitting central exhibit within the National Museum when it opens. 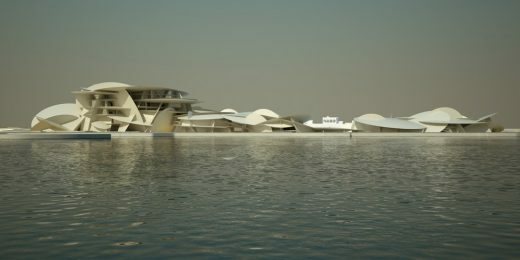 Marking the next stage of its program to develop Qatar into a hub of culture and communications for the Gulf region and the world, the Qatar Museums Authority (QMA) today revealed its plans for the new National Museum of Qatar, as expressed in a striking and evocative design by Pritzker Prize-winning architect Jean Nouvel. Embodying the pride and traditions of Qatar’s people while offering international visitors a dialogue about rapid change and modernization, the National Museum of Qatar will be the setting for a program in which entire walls become cinematic displays, “sonorous cocoons”, shelter oral-history presentations and hand-held mobile devices guide visitors through thematic displays of the collection’s treasures. Though built around an historic structure, the Fariq Al Salatah Palace, which had served as a museum of heritage since 1975, the National Museum of Qatar is conceived and designed as a thoroughly new institution, in keeping with the high aspirations that animate QMA. Jean Nouvel’s design manifests both the active, dynamic aspect of the Museum’s program and its crystallization of the Qatari identity, in a building that, like a desert rose, appears to grow out of the ground and be one with it. Prominently located on a 1.5 million-square-foot site at the south end of Doha’s Corniche, where it will be the first monument seen by travelers arriving from the airport, the building takes the form of a ring of low-lying, interlocking pavilions, which encircle a large courtyard area and encompass 430,000 square feet of indoor space. In its organization, the building suggests the image of a caravanserai-the traditional enclosed resting place that supported the flow of commerce, information and people across desert trade routes-and so gives concrete expression to the identity of a nation in movement. The tilting, interpenetrating disks that define the pavilions’ floors, walls and roofs, clad on the exterior in sand-colored concrete, suggest the bladelike petals of the desert rose, a mineral formation of crystallized sand found in the briny layer just beneath the desert’s surface. 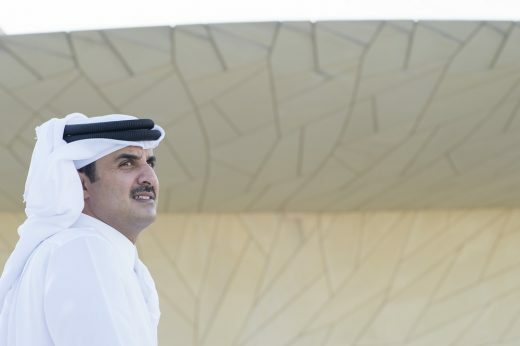 The National Museum of Qatar building will provide 86,000 square feet of permanent gallery space, 21,500 square feet of temporary gallery space, a 220-seat auditorium, a 70-seat food forum / TV studio, two cafés, a restaurant and a museum shop. Separate facilities are provided for school groups and special guests. Staff facilities include a heritage research center, restoration laboratories, staff offices and collection processing and storage areas. 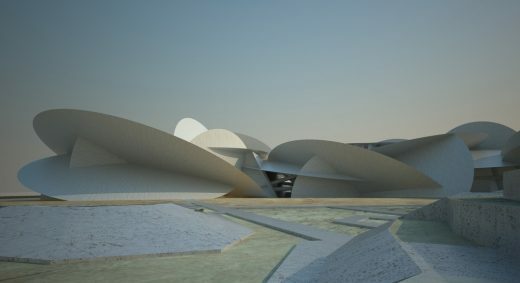 The Museum will be surrounded by a 1.2 million-square-foot landscaped park that interprets a Qatari desert landscape. Inspired by the desert rose, the interlocking disks that compose the building-some of them standing more or less upright and acting as support elements, others lying more or less horizontal-are of varying curvature and diameter. The disks are made of steel truss structures assembled in a hub-and-spoke arrangement and are clad in glass fiber reinforced concrete panels. Columns concealed within the vertical disks carry the loads of the horizontal disks to the ground. Like the exterior, the interior is a landscape of interlocking disks. Floors are sand-colored polished concrete, while the vertical disk walls are clad in ‘stuc-pierre,’ a traditional gypsum- and lime-blended plaster formulated to imitate stone. Thermal buffer zones within the disk cavities will reduce cooling loads, while the deep overhangs of the disks will create cool, shady areas for outdoor promenades and protect the interior from light and heat. Steel and concrete, the main materials of the building, will be locally sourced and/or fabricated. The landscaping will feature sparse native vegetation with low water consumption. Through these and other sustainability measures, the Museum is working to achieve a USGBC LEED Silver rating. The Museum’s gardens are specifically designed for the intense climate of Qatar. Plantings will include native grasses and indigenous plants, such as pomegranate trees, date palms, herbs and the Sidra tree, the national tree of Qatar. Landscaping will feature sand dunes and stepped garden architecture to create sitting areas and spaces for the Museum’s programs of tours and garden lectures. A tour of the Museum will take visitors through a loop of galleries that address three major, interrelated themes. These are the natural history of the Qatar peninsula, with its flora and fauna that have adapted to this intense environment of sand and sea; the social and cultural history of Qatar, with its traditions, values and stories that spring from the close, age-old interaction between the people and the natural world; and the history of Qatar as a nation, from the 18th century to the dynamic present. The displays and installations that explore these themes will integrate exciting and involving audiovisual displays, some of them realized on an architectural scale, with carefully selected treasures from the Museum’s collections. These collections currently consist of approximately 8,000 objects and include archeological artifacts, architectural elements, heritage household and traveling objects, textiles and costumes, jewelry, decorative arts, books and historical documents. The earliest items date from the end of the last Ice Age (about 8000 BC). The Bronze Age (about 2000 – 1200 BC) is represented, as are the Hellenistic and early Islamic periods. The Museum also has examples of weapons and other objects from the period of the tribal wars and more contemporary decorative objects used for everyday living. The National Museum of Qatar is being developed by the Qatar Museums Authority, which under the leadership of its Chairperson, H.E. 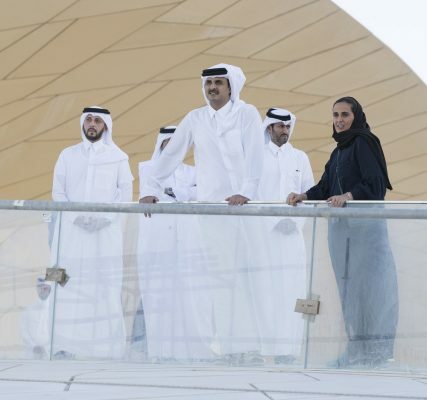 Sheikha Al Mayassa Bint Hamad Bin Khalifa Al-Thani, is transforming the State of Qatar into a cultural hub of the Middle East. Qatar Museums Authority was created in December 2005 to combine the resources of all museums in the State of Qatar. The QMA’s vision revolves around the provision of a comprehensive umbrella under which future plans will be drawn for the development of national museums and the establishment of an effective system for collecting, protecting, preserving and interpreting historic sites, monuments and artifacts.